For your convenience this post contains referral links for products we use and genuinely recommend. By far my biggest concern when traveling with a toddler is how it will disrupt our normally wonderful sleep schedules. My girls and I both thrive on our predictable routine, and I’ve literally had nightmares about how a trip could ruin all of the happy sleep habits we’ve worked so hard to implement. I know some moms who are easy-going and flexible about naps and bedtimes. Not me! At home, our youngest happily plays in bed until the generously late hour of 9:00 or 9:30. She goes down for her nap at 1:30. She sleeps for 2.5-3.5 hours. Daddy puts her to bed for the night around 8:30. This is predictable and our normal. This works for us. But an early flight messes with nap time. Strange hotel rooms make it difficult for our little one to fall (and stay) asleep. And a change in time zones throws off all of our internal clocks. 7) We’ve also rearranged hotel furniture and created an elaborate makeshift wall from curtains, sheets, and blankets to create a visual barrier. Sometimes, all our girls need to settle down is not to see us. A blanket wall (that is safely out of reach so that your little ones don’t tug it down) may be the thing you need to make sleeping in one room a surprisingly delightful experience. 8) Bring your own (baby) bed. We’ve been known to pack a Pack ‘N Play like this: Graco Pack ‘N Play Element with Stages, Oasis . But I’ve heard that there are several that are even lighter and more portable. We figure our babies sleep better in their own beds, AND this guarantees that the beds are safe and not on a recall list. 9) If you don’t want to lug around a baby bed, at least pack a sheet or bedding. Maybe babies and toddlers aren’t REALLY that sensitive to scent, but I like to think that a sheet that smells like home has to be more comfortable to little ones. 10) Don’t forget the favorite comfort item. For us, that’s a pacifier. 11) The most we’ve attempted is a three-hour time difference. And because it was “only” a three- hour time difference, we decided to put our kids to bed about halfway between their normal bedtimes and what bedtime would be if we switched completely to local time. That is to say, we split the time difference. With this setup, we were all able to enjoy a few peaceful nights of completely uninterrupted sleep. Yes, they wake up early according to local time, but 6:00 a.m. felt like 9:00 a.m. to us, so it wasn’t a big deal. My final sleep-related fear is that a time change will throw things off when we return home. I’ve read that parents should give their children four or five nights to adjust before they freak out about how messed up things seem. While it does take our girls some time to get back into their usual routine, they also often sleep MORE for a few days since they’re exhausted from the travel and the trip. With an outcome like that, what’s not to love about family travel? Did you catch some of our other favorite family travel posts? Tips for making it through the airport with little ones. How we keep our kiddo busy and happy on the plane or car. And for those brave enough to travel with an infant, check out 15+ Must-Read Tips for Flying with a Baby. For a complete list of items we consider to be essential travel gear, check out our travel gear page! ← Activities for Travel–What’s in Our Travel Bag of Tricks? It sounds like you have really been successful figure it all out. 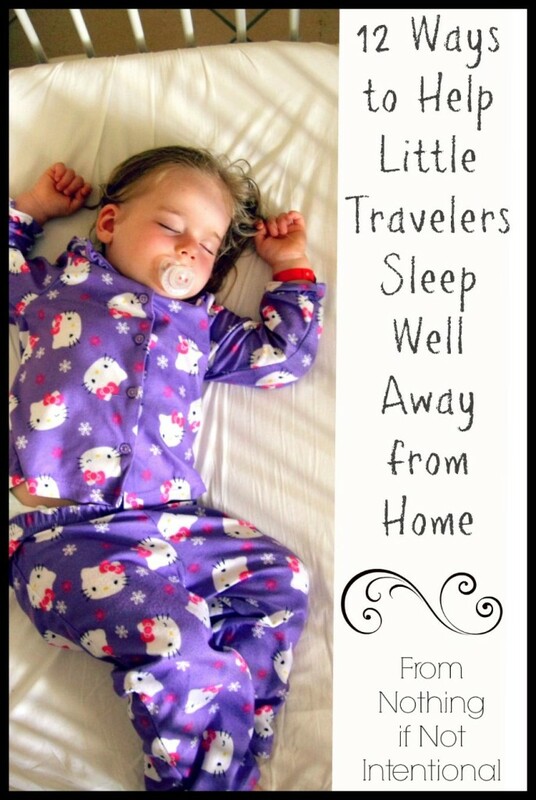 We found that having a pretty strict schedule at home helped our kids to be better sleepers on the road. I hope it will be the same for you with two little ones. Our sleep always goes out the window when we travel. 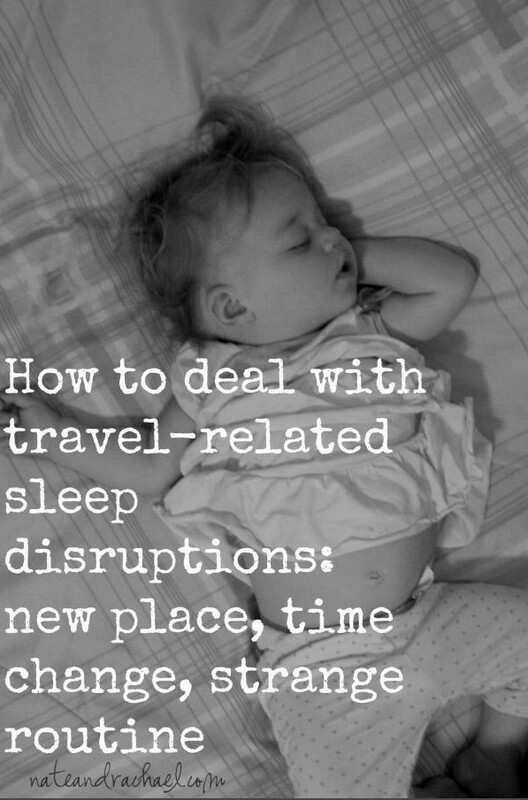 These are great ideas – I have scheduled plane flights around nap times, I definitely try to keep it consistent when we travel (although it never seems to go as planned). Thanks for taking the time to read and comment, Andrea! It has worked SO well for us to split the difference! And your blog is GORGEOUS. Do you have a facebook page? I’d love to follow you there!